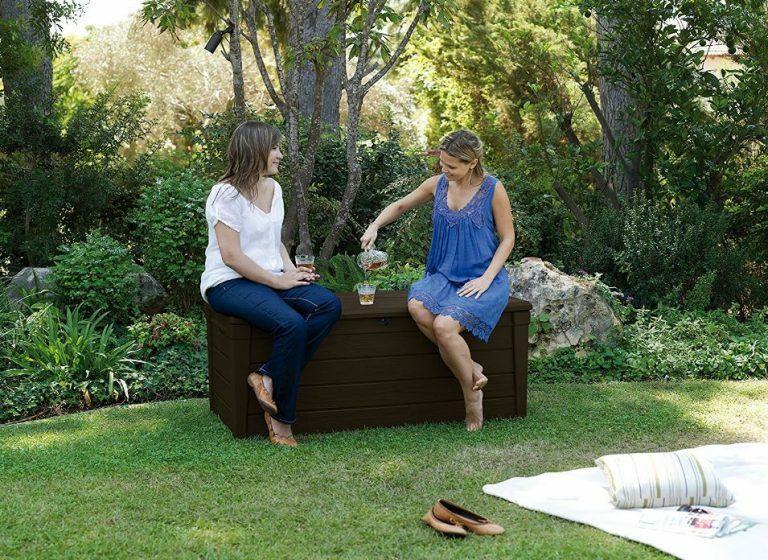 Various shades exhibit Brightwood’s innovative design of garden storage boxes. Plastic in manufacture they simulate appealing wooden styles in conjunction with combining the armoury of weather-resistant polypropylene. Presuming the benefits of a competitive price, weather-resistance & effortless to clean lights your candle further to doubling-up for extra seating & table top services, Brightwood deck boxes epitomise organising outdoorsy accessories besides stepping-in to assist alfresco dining. 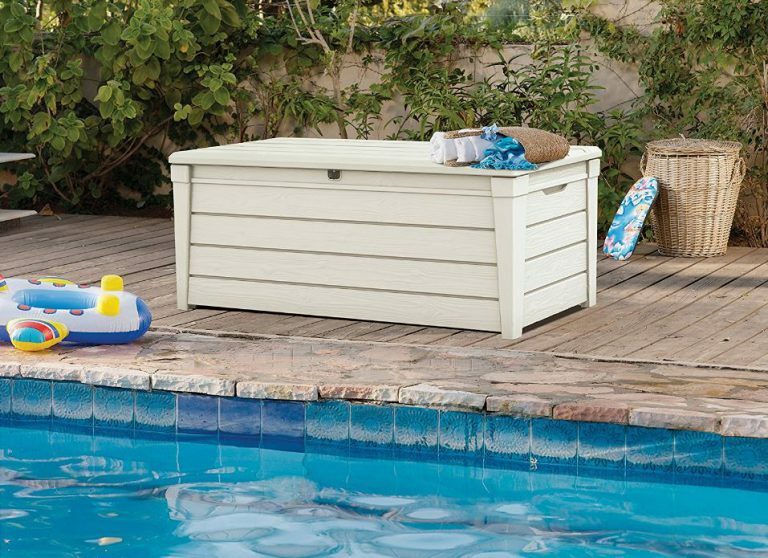 Keter’s Brightwood storage boxes organise umpteen storage solutions, either located on the patio deck, balcony, poolside or sat indoors serving requirements. Four shades currently conclude the Brightwood range: anthracite grey, taupe, white and espresso brown. We use this style of storage solution sat on our patio storing bulky seating cushions meanwhile their sturdiness provides the advantage in catering for extra seating when guests arrive whilst the flat lid conveniently transforms into table-top use during summertime, accommodating food & drinks; a handy accessory for BBQ times. It’s a common occurrence to see two or three various styles and sizes of resin deck boxes accommodating homes nowadays. 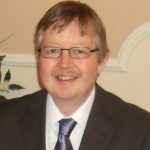 Once you realise the potential one has to offer, organisational ideas spring into action with desires to purchase more. Check out Brightwood’s deck box competition – There’s a wide range of styles & sizes to choose from including Duotech’s groundbreaking Brushwood design offering equivalent storage capacity encased in the mirror image of wood. Keter’s manufacturing technique involves molding polypropylene to showcase an exquisite semblance of horizontal wood-panelling embossing intricate wood-grain details throughout the surface meanwhile surrounded by the creation of four molded corner posts and a couple of hand-grips presented either side. Colour pigments blend within the polypropylene to exhibit either anthracite grey, taupe, espresso brown or white shades, delivering appealing accents to complement the settings of most home-yards meanwhile UV protection combines to armour the manufacture against the forces of sunburn bleaching colours and causing fractures. Polypropylene provides defence against weather attack; resisting rust & rot it never decomposes. Favourably it’s recyclable, therefore can be remoulded into the future’s groundbreaking designs when the time comes to replace. 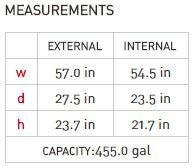 Moreover, Brightwood’s impermeable composition is designed weatherproof to promptly repel rainfall while maintaining dry internal conditions, suitable for storing cushion fabrics. The beauty regarding a polypropylene make-up relates to their jiffy-to-clean surface. Mild detergent mixed with warm water and wiped with a cloth sums-up the speed it takes to freshen appearances. Brightwood’s mid-range capacity stores up to 454 Litres / 120 Gallons internal volume, capable of accommodating 50 kg / 110 lbs of storage, delivering handiness occupying tight spaces & balcony settings alongside providing bench-seating & table-top services. Inside the box, you’re presented with a sequence of resin ridges including the reinforcements of a metal bar; not the most attractive of displays granted, however, these are purely intended for rigidity purposes. The lid supports a seating capacity of 300 kg / 661 lbs which equates to around 47 stone, therefore supports two adults. 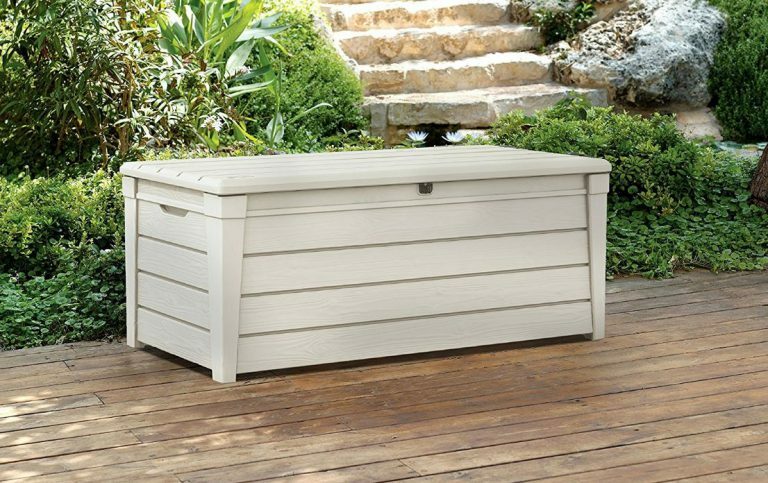 A sturdy deck box seat equips a balcony or patio with a hugely popular & convenient service, especially at BBQ times when friends visit. Our lid is soon cleared away to offer extra seating meanwhile also beneficial for the next topic, table-top services. A flat lid was high on our agenda searching through the various deck box designs. We personally use ours for storing seating cushions on the patio whilst the flat lid conveniently occupies drinks besides providing a regular placement for outdoorsy mealtimes throughout summertime. We merely require a blaze of sunshine & the deck box swiftly serves to full potential. Brightwood deck boxes incorporate two gas shock pistons either side of the lid to effectuate easy access through their near automatic opening system. The pressure held within the shocks swings the lid ajar once the box starts to open. 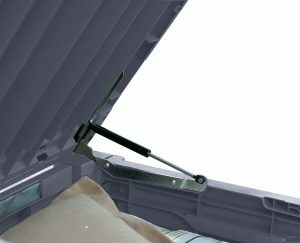 Once fully open, the piston pressure holds the lid stationary and prevents closing, a feature we find beneficial when setting out & storing away arms full of bulky seating cushions. Child friendly, the gas pressure steps in upon closing, putting a soft-close mechanism into operation. Importantly, the pressure forces the hefty lid expanse from slamming down and trapping fingers. 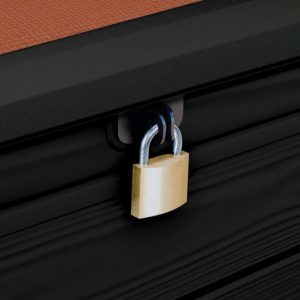 Hand grips molded into both sides assist lifting the Brightwood when changing location meanwhile two metal clasps align from the box body & lid when closing, designed for slipping through a padlock to lock & secure. Thanks to recent innovation, assembling these types of resin deck boxes has become very streamlined, leading many to accomplish construction in 15-20 minutes. Within ½ an hour from unpacking & checking delivery, a Brightwood deck box can be assembled, located and serving requirements. Installation is efficiently constructed with two people and involves 13 steps of clicking panels together, fitting the pistons and securing a dozen screws with a Philips-head screwdriver. 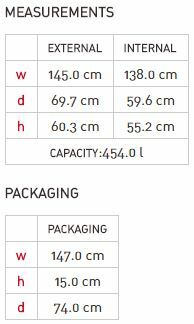 Inspecting the instructions below demonstrates their ease of construction whereby assemblers follow the steps, implementing the procedure. Unfortunately a few people have received damages due to poor stock control & delivery standards. Personally, I wouldn’t accept a damaged delivery and would return the package if damages were discovered after delivery. With regards to missing parts, I would contact Keter immediately. Help & Support phone numbers are presented within the instructions or you can contact them via their website. Whether intentions are to combine the storage of patio accessories & furniture cushions with additional seating & table-top services or perhaps store the BBQ gear, generate the quickest of garden tidy-ups for kids toys, shelter gardening tools & plant feed or harbour away sporting equipment, work tools and alternative outdoorsy stuff, Brightwood deck boxes provide the solution. Child friendly access is assisted by the hydraulic pistons, the recyclable UV protected polypropylene delivers resistance to weather-rot whilst the surface is a doddle to wipe over & refresh. Available in either white, taupe, anthracite-grey or espresso-brown, Brightwood’s exhibit a selection of charming presentations to furnish any outdoor space meanwhile provide 2 years of warranty assurance inclusive of their fair-value price. Thanks for exploring Brightwood’s presentable version of a plastic garden storage box. Share your favourite resin designed deck box below along with any related queries, pleasure to help. Please share the Brightwood. Thank you. What a great idea, now I can up grade my patio to a larger size , would only need my cluttered shed for the lawn mower, would be a great storage for my canning needs out of the summer season. and the added setting would be great for the family bar-b-que as I have a large relative that normal lawn seating does not apply . Thanks so much for sharing !! Hi Terri, we find our deck box serves for extra seating which is beneficial when friends visit, the flat lid serves as a table-top which is useful for barbecue times as well as serving as a centre patio table for placing drinks on top meantime accommodates the outdoor furniture cushions which previously created hassles indoors trying to find enough room where to store their bulkiness. 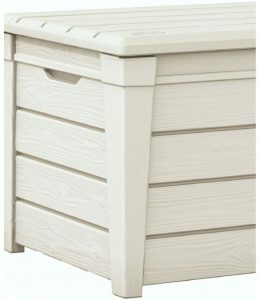 Brightwood storage boxes are designed to accommodate a seating weight of 661 lbs / 300 kg which in my book equates to approximately 47 stone, therefore it’s sturdily built for supporting two weighty adults. They’re convenience shines through for a varied selection of services. Storing kids toys or seating cushions like we do relates to their most popular services meanwhile accommodating outdoorsy accessories, sporing equipment, outdoor wear & shoes and gardening or BBQ supplies describes alternative favourable storage solutions. We have a friend who empties the box and converts to a dry wood log-store over wintertime for his fireplace. Like he says, once the lid is closed the deck box design is styled weatherproof to keep the internals dry, even throughout stormy times however he prefers to lock the box with a padlock to stop the gales opening the lid. What an interesting item, who would have thought of making storage boxes so pretty and sturdy at the same time. I love that the lids won’t slam shut. That saves not just children’s fingers from being smashed but mine too. I like the taupe color. I like that they look so durable and usable, that it is not only for storage but you can use it for a sturdy seat and also for a table. Its just a great idea. It does look as if anyone could assemble it pretty quickly. 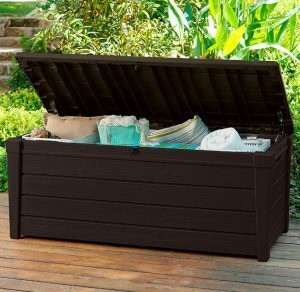 Thanks for dropping by to read about Keter’s garden storage boxes. These are such a useful storage solutions both indoors and out, we have many friends and family who have decided to purchase these to organise their home and yard. Although they are stylishly presented, their beauty lies within their weather-resistant make-up, withstanding decay especially over the expanse of their flat lid when stood in damp conditions is something their wooden counterparts can’t avoid, hence the wooden variety are seldom seen nowadays in a deck box style. Cleaning becomes a breeze too, a swift wash or wipe with a cloth simply restores their shine. The child friendly pistons are a great inclusion across the Keter range of deck boxes as they support the lid weight, making sure they don’t slam shut. Not all deck boxes have the same design, it’s all down to personal preference. 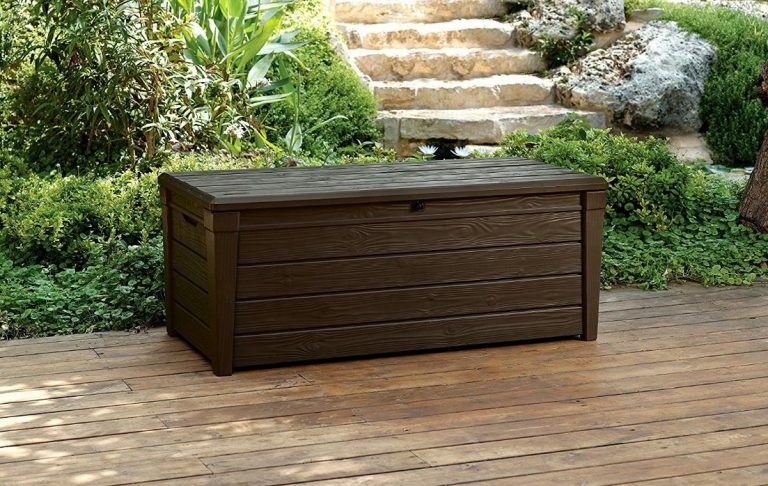 We for instance searched for a flat lid for table-top services and one that supports seating yet large enough for outdoor seating cushion storage, this depends on the dimensions and style to suit one’s services. 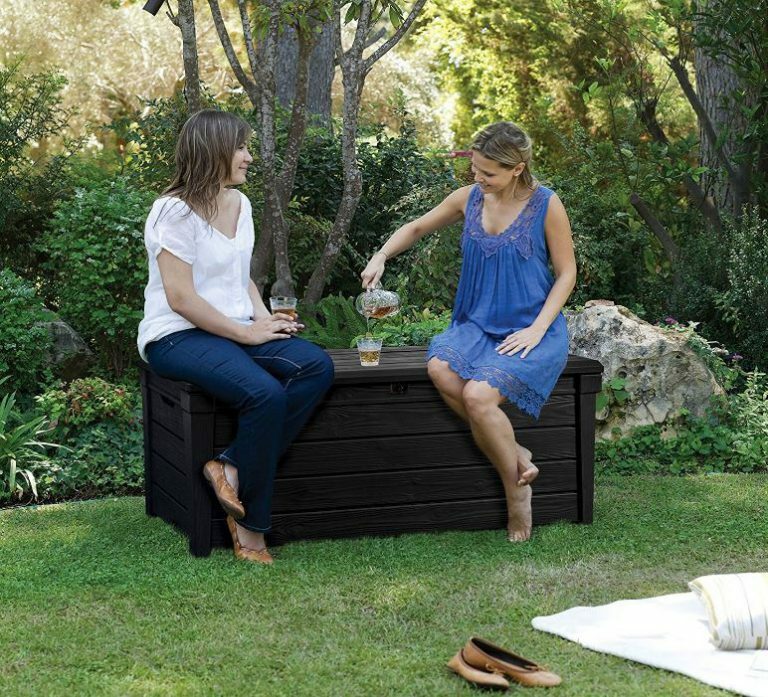 Hi I think this product is brilliant, not only do you have extra storage but you double as a seat or table, i am going to buy a Resin shed this summer i am getting the ground ready at the moment, so to have outside storage to match the Resin shed is a plus. The only question i have is if you store your garden seating cushions for the winter, would there be any moisture inside the box with the change in the weather? I would be concerned with mildew. I be looking to buy a storage box to match the shed i will be buying great product. 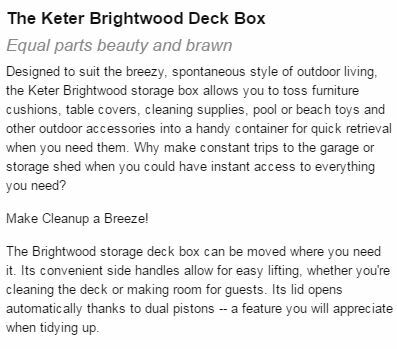 Thanks for calling in and reading about these 4 different colours represented in Keter’s Brightwood range of deck boxes. 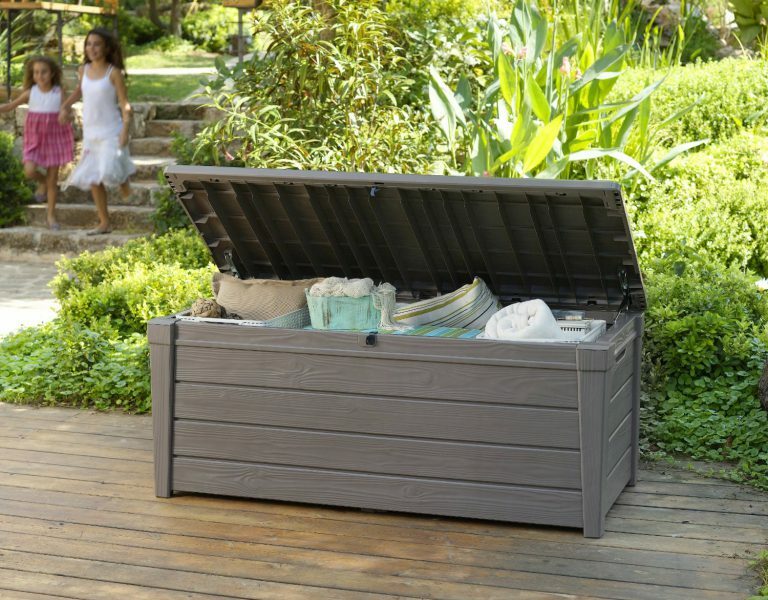 We use our deck box for storing patio accessories and seating covers whilst the flat lid is superb for a table services plus it provides extra seating when visitors arrive. We always empty the box in mid Autumn when the weather starts to change in the UK, because like you mention they would probably become damp and mildew may develop. We place the covers in the loft and bring them back out mid spring when the weather becomes warmer, they remain in the box when not in use till Autumn. 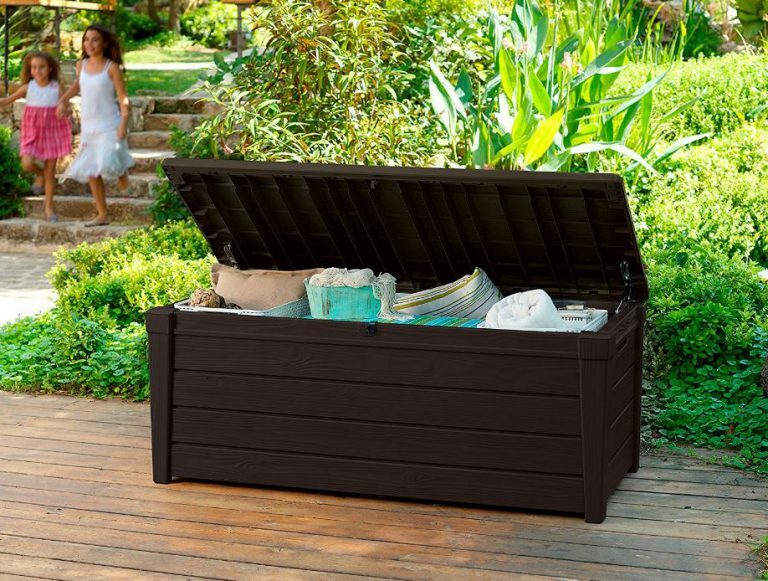 They save so much storage space and hassle finding a place to put them indoors, deck boxes simplify the process and make summer living hassle free. 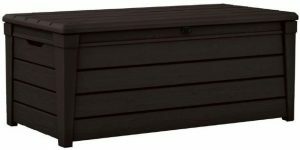 Yeah, try and match a deck box with your shed, great idea, this will complement your outdoor space.